One of the most important tools in any kitchen is a good knife. A chef’s knife and a paring knife are all that you really need to efficiently and effectively prepare any dish – plus maybe a good serrated bread knife. When choosing a knife, look for one that is made of stainless or carbon steel and that has a sturdy handle. It is also important to make sure that the knife is the right size for the cook. 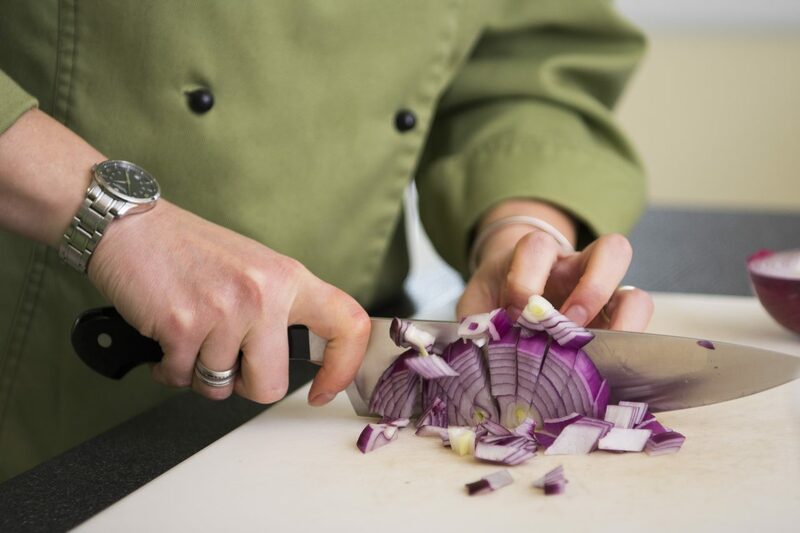 Most adults can work effectively with an eight-inch chef’s knife, but six-inch and twelve-inch options are available for those with smaller or larger hands. A good knife should have some heft to it. Remember that much of what makes a knife an effective tool is not just its sharpness (we’ll get to that in a minute) but also the power that it provides. A knife is a lever and a wedge (remember high school physics?) and a heavier blade closer to the user’s hand will help to deliver more power. As for that blade, keep it sharp with regular honing and semi-frequent sharpening by a professional with a whetstone or grinder. A sharp knife is a safer knife. Which would you rather have – a clean cut that can be easily sutured or a jagged one? Before you purchase a knife, test it for balance to be sure that the weight of the steel is evenly distributed. Hold out your palm face up with the middle three fingers out. Rest the juncture of the handle and the wide part of the blade on your fingers and let the knife come to balance. A well-balanced knife will lay still and not tilt to one side or the other. A good knife is an investment that can last a long time. Most good quality, basic knives cost around $75 dollars but with proper care can last for many, many years. One of the first knives I purchased for culinary class nearly twenty years ago is a little narrower from years of sharpening, but still handles great. If you are considering purchasing a knife for your own kitchen or as a gift, keep an eye out for Henckels’ annual factory sales in Westchester and Manhattan in the fall. It’s a great way to get a good deal on a high-quality knife. A good knife can help to make a cook more efficient, but only if used properly. The first class in our Back to Basics series is Knife Skills for a good reason. Once you get to know the proper way to handle a knife you will work faster and more efficiently and no longer feel daunted by a recipe that calls for lots of chopping! Get in touch with us to schedule your knife skills class or buy a gift certificate for your friend or loved one to learn how to use their new knife.